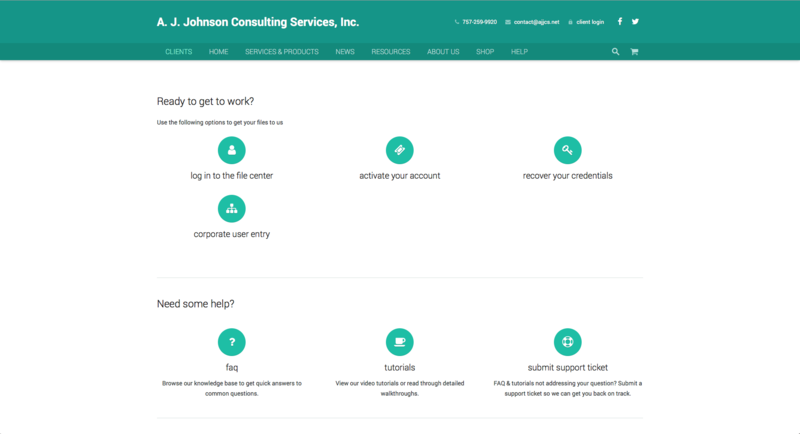 Text Tutorials – A. J. Johnson Consulting Services, Inc.
Account activation is the first step in the process of sending files. It only needs to be completed once, but can be repeated in order to recover lost credentials. On the Clients page on the website, click the “activate your account” option. Enter the activation code that was provided after completing the property information sheet. If you do not have an activation code, please contact your supervisor to obtain the code from the appropriate person in your company. 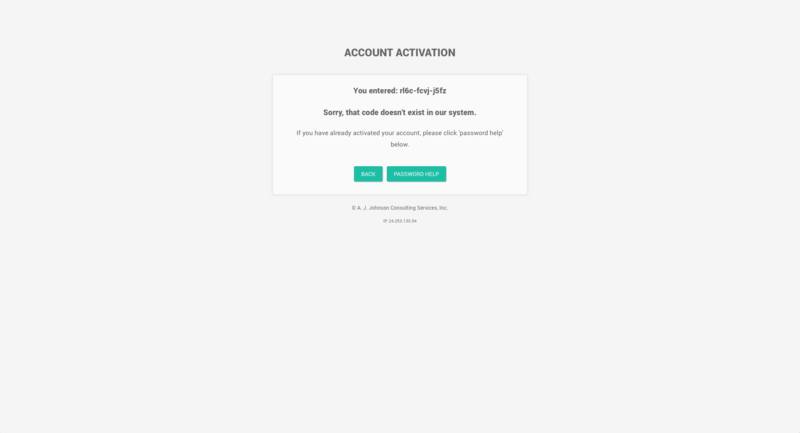 After entering the activation code, you will either be provided with your credentials to log in, or with an error message. The code you entered will be shown to you. If you receive an error message, please confirm you have entered the code correctly, keeping in mind that lowercase L can sometimes look like a 1 (one), depending on the font being used. 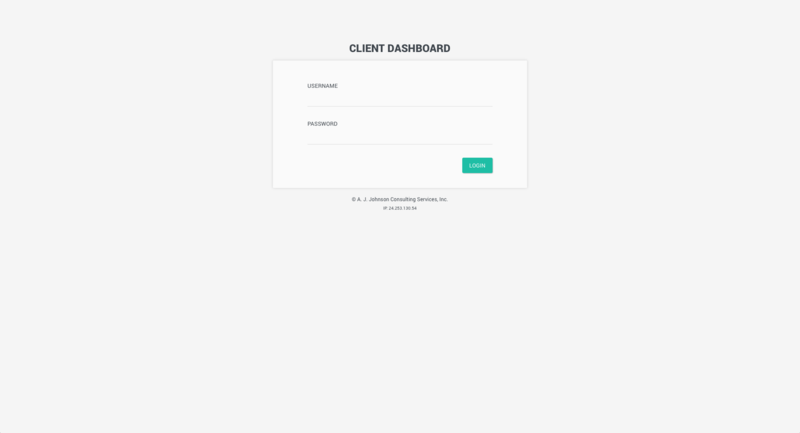 On the Clients page, click the “log in to the client dashboard” option. A new window or tab will open with a login box. Enter your username and password, then click the Submit button. 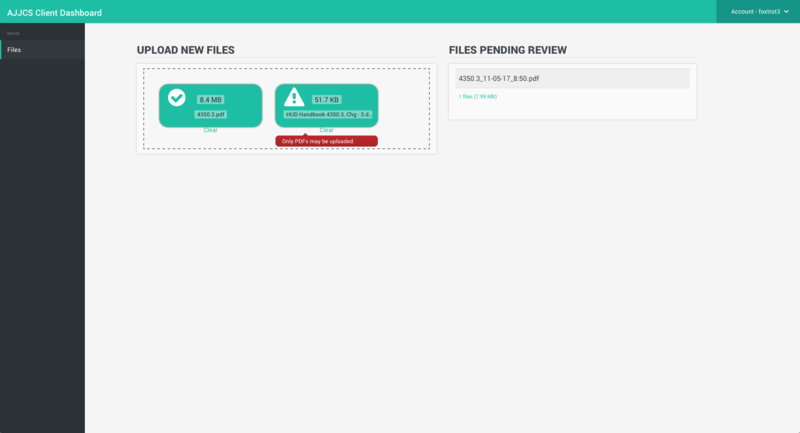 The main interface for the File Center is a navigation bar along the top of the screen, a menu on the left side of the screen, a large drag & drop enabled upload space, and a list of your files currently pending review. The drag & drop feature is available to users visiting the File Center using Internet Explorer 9 or higher, or any other internet browser (Firefox, Chrome, Safari, etc.). 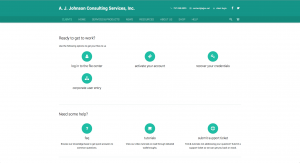 The navigation bar includes links to view support information, and logout. To upload files, you may either drag & drop your file(s) on top of the upload space, or you can click anywhere in the upload space to open a window from which you may select your file(s). The upload process will begin immediately, with no additional interaction needed from the user. A progress bar will appear, showing the user the amount of time left for the upload to complete. Upon completion, a checkmark will appear, indicating success, or an exclamation point will appear, indicating there was an error. Hovering your mouse cursor over the exclamation point will provide a description of the error. Once the upload has completed, you may logout and/or close the window/tab. For additional confirmation that files have been uploaded, or to view which files are currently awaiting review, you have the ability to view the files you have uploaded. The list of files you have uploaded that are currently awaiting review are shown to the right of the upload area (beneath the upload area on mobile devices). This list updates in real time, so the list you see will be up to date. If you need the status of a file that is not shown in the list, please visit the Support Desk and select the option, “File Status Request”. This is not a rigid list of documents. Additional documentation you feel may be useful in reviewing the files may be submitted, and a lack of documentation may not mean a review can’t be completed. If you have a specific question about the documentation to submit for review, please submit a support ticket under the topic “General Issue”.